Lexus has introduced the GS facelift at Pebble Beach where it shares the spotlight with the 2016 LX 570. The biggest news is the addition of a 200t rear-wheel drive version with a 2.0-liter, four-cylinder gasoline engine also seen in the RC 200t and NX 200t. It pumps out 241 bhp (180 kW) and 258 lb-ft (349 Nm) of torque and works exclusively with an eight-speed automatic transmission granting the vehicle with an estimated fuel efficiency of 33 mpg US (39.6 mpg UK or 7.1 liters / 100 km) on the highway. This new member joins the existing GS 350 which soldiers on with a V6 3.5-liter which for the 2016 model year has gained an extra 5 bhp (4 kW) and 3 lb-ft (4 Nm) for a grand total of 311 bhp (232 kW) and 280 lb-ft (379 Nm) channeled to the same eight-speed auto. The GS 450h continues to use the same hybridized V6 3.5-liter with 338 bhp (252 kW) transferred to the road via a CVT. This hardware setup enables the model to perform the 0-60 mph (0-96 km/h) run in 5.6 seconds and return an EPA-estimated 29 mpg city / 34 mpg highway / 31 mpg combined cycle. 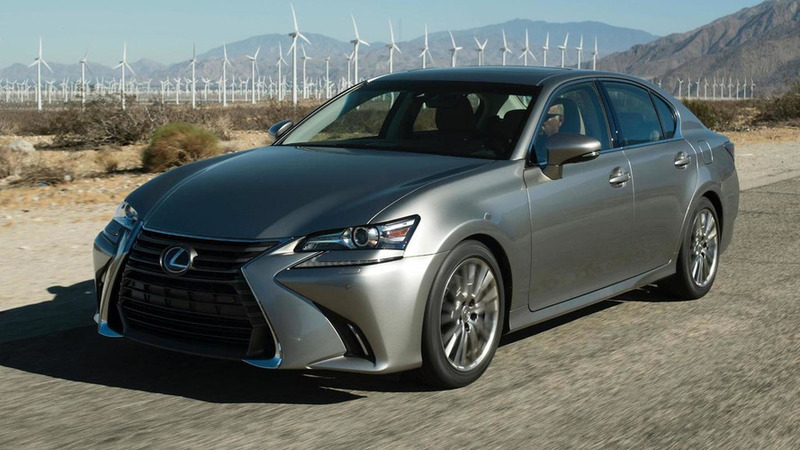 In terms of styling changes, the 2016 Lexus GS facelift has a modified front end with a more aggressive spindle grille and bi-LED headlights along with updated taillights and some rear bumper tweaks. Other novelties include standard navigation for GS 350 and GS 450 h models, a bigger 4.2-inch instrument cluster display and a 12.3-inch screen for the infotainment system which now has side "enter" buttons on the remote touch interface. Also new for the 2016MY are several exterior and interior colors, wheel designs, wood and aluminum cabin trims and a Lexus Safety System + that packs Pre-Collision System (PCS) with Pedestrian Detection, Lane Departure Alert (LDA) with Steering Assist, Intelligent High Beam (IHB) and All-Speed Dynamic Radar Cruise Control. Visit the press release area for full details.